We are just coming back from a big 2 weeks in Punta San Carlos ! 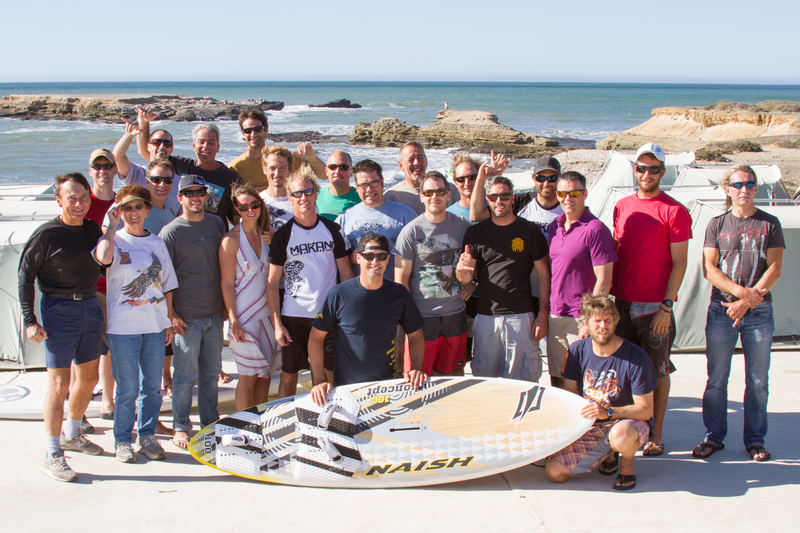 For most of the Makani followers it was not only the first time in PSC but also the first wave riding trip ! Overall it's been an amazing experience except for one thing ... most of the fins to be tested got lost by AIR CANADA and we could not get them on time for testing. However the main goal was the new tri-fins set up and we had the protos with us so we were saved and they will be in production for 2013. I guess we will have to repeat the experience in 2013,14,15... Here is some appreciation of the spot, the crew and the gear ! Punta San Carlos is located about 2 and half hours of flight or an 8 hour drive from San Diego. Its on the coast of the Pacific on the Baja Penninsula. The location is amazing for windsurfing, sup or kitesurfing as the waves are peeling in a superb bay . It is actually the perfect spot to learn wave riding not only because the waves and wind are constant but mostly because the bay makes it safe to ride and the waves always bring you back to the beach whatever happens as long as you dont start going all the way out. So in other words anyone who can waterstart and jibe can hit Punta San Carlos and enjoy it ! Its not an only expert riding place where there is tons of current and the waves are bashing you the coral reefs, far from that and at low tide you are actually mostly landing on a nice sandy beach. Rocks are present but once you know where to go they are easy to avoid. Most of us actually sailed without booties for the whole 2 weeks. As for the wind well it's a thermal wind coming from the desert land so the mornings are a good time to enjoy nice bike rides in the back country or play in the waves with the SUP. By the way the SUP rides are the best way to start learning to wave sail and to get the right timing catching waves so once you get there and want to get the most out of your trip user them as much as you can. Then in the afternoon there is a nice 15-25 breezes most of the time so you can sail with sails ranging from 4.5 to 5.5 and boards 85-95 l depending on your size. Most of us sticked with almost the same sail and board for the complete trip. So for those who wonder still wonder if there is waves and wind in PSC ... YES super nice waves ! And in the end we all said, thank god we had clinics ! Everyone is provided with a nice tent with sleeping bags. The nights are cool but not cold and comfort in the tent is perfect without any AC or fans ! All the waves crashing on the rocks and the moonlight makes it even better for a good and relaxing sleep. The food is amazing and the Mexican staff is doing everything to accommodate everyone with all their needs. All the meals are super complete with a nice Mexican touch and you can add the spicy sauce after if you like it ! The after sessions are always celebrated at the bar with BAJA FOG's and happy hour snacks ! The pantries are filled with all the snacks you can imagine if ever you have the munchies at any time of the day. In the evening the bar is full of action and you can get Margaritas, nice wine or more baja fogs ! Its all included !!!! The tri-fins prototypes were tested by Tyson Poor and our new team rider JOEY SANCHEZ and we will make the asked modifications. It appears the center fins had slightly too much chord for tight turns and the carbon g-10 version was a little to stiff. We also tested newly designed twin fins for use with the quads and twin fin boards but some more testing are needed. In twin fin mode they rock for sure but the added area might not be needed for quad mode so we got more riders on them now like Omar Sanchez in Pozo ! Its much easier than we thought to get there as once you hit San Diego Kevin Trejo the owner and his team is taking care of you like a king ! They pick you up at the airport and bring you to the smaller airport for the flight to PSC ! The other guys ride your luggage to the spot. So all in all they take care of you like a superstar making you a king for 2 weeks were all you have to worry is to know when you hit the water and when you get out of it ! If you want to open the door of wave riding it is most certainly the best place in the world and if you want to get better at it its also one of the best in the world for sure ! So get there sooner then later as there is always a reason not to go and once you go you will say "why did I wait so long "